We’ve just produced this excellent Halloween fun pack for Razamatazz Magic. Razamatazz Magic produce a wide range of entertainer’s and public magic tricks. From card tricks to balls, illusions and all kinds of fun with high quality bold and bright designs that are well designed and proven to last. The Halloween pack contains a series of A4 cards and a board complete with spooks, spectres and a skeleton! The cards have been printed and mounted on to display board and laminated to make them look like massive playing cards! 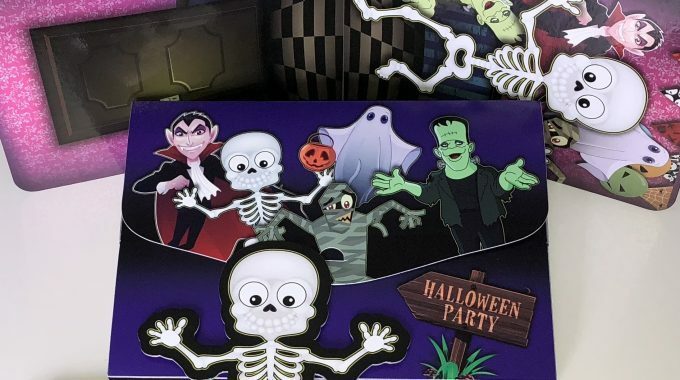 The pack also contains a skeleton who has been mounted and die-cut. Everything is contained in a wallet which has been screen printed. Who will go to the Halloween party – you’ll have to wait and see !! We at Razamatazz Magic and importantly our customers have been very pleased with the quality and accuracy of the Halloween Rampage trick made by Kingfisher Press. Thank you to all at Kingfisher Press for the professional and friendly service. We love making games and puzzles at Kingfisher Press. We have in the passed helped to produce many games, check out our blog here to see what else we have helped to produce from Adult card games to Childrens flash cards helping to learn to tell the time. Helping clients to produce different and bespoke projects is something we have great experience with. If you have a project in mind and would like to find out how you can bring your idea to life through print then give us a call. Kingfisher Press offers High Definition Digital, Litho and Wide Format print. Find out more about our services by visiting the Kingfisher Press Website here.